Wondrous Kitchen & Bathroom provides a range of handcrafted, quality wardrobes in Sydney that will help turn your dream room into reality at affordable prices. We know that most people like to have their room look as tidy, spacious and visually pleasing as possible and a built in wardrobe may be a focusing piece in the room. This is why we like to provide the best looking and fitting wardrobes for your place that can fit your tastes and improve the overall look of the room, all within your budget. Our craftsmen specialize in making built in and custom fitted contemporary and traditional wardrobes in various styles for Sydney Customers. Your fitted wardrobe will be made exactly for your needs and your place. 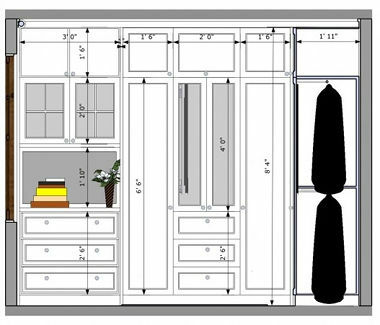 We can design your wardrobe to fit exactly in the space you want to, and position the shelving, hanging and drawer space to perfectly accommodate your needs and clothes. We will work closely with you and design your wardrobes to your bespoke specifications or we can also give you different options and ideas that would suit perfectly your place and your needs if undecided. We have a team of knowledgeable and experienced craftsmen and custom fabrication combined with attention to detail allows us to design the perfect built in wardrobe for your home. With us, you don’t have to worry too much about your budget. Our craftsmanship allows us to create stunning wardrobes in Sydney using the finest materials that would still fit your budget due to clever design. Let us know what you need, and we will turn your dreams into reality by delivering the custom design, made-to-measure, fitted wardrobe fitting exactly to your requirements. Wondrous Kitchen and Bathroom can give your bedrooms a make-over with new, custom-made, sliding or hinged wardrobe or even can convert a spare room into a walk-in closet. Many homeowners today prefer sliding door wardrobe which is a great way to utilize empty corners. Additionally, sliding doors mean that space is not wasted for opening the doors outwards. Walk-in closets are the ultimate symbol of luxury where a small room or a spare room is converted into a closet with shelves, storage as well as chairs and often a dressing table. A large bedroom can also be converted into a walk-in closet with the help of sliding doors or a room divider. Depending on your budget, we can remodel the space to be more efficient. Wondrous Kitchen & Bathroom also provides wardrobe fitting and installation services that would help you put in place the wardrobe you chose for your place. Either you want to have a custom-made wardrobe or choose a pre-made one that would suit perfectly your place, with us you wouldn’t have to worry about the stress and effort that would imply having it standing in the right place in your home. We supply and fit any wardrobes so all you have to do is choose it and then we will make sure it will be properly assembled, installed or fitted into your house. Whatever size, design and features you need for your wardrobe, we can create exactly what you need and have it installed and fitted in the spot you chose. For more information about our services and a FREE quote, please contact us at 0416 565 455 or 1800 779 603.